Hands of men touch globe. Two adult businessmen. Discussion of scientists. What future awaits the Earth. Linear Gleam. rotating globe. Model of the planet earth. Corporate World. Earth Technology Background. Animation of globe rotating with technology world map in the background. Rotating green planet. A symbol of pure ecology. rotating globe. Model of the planet earth. Corporate World. 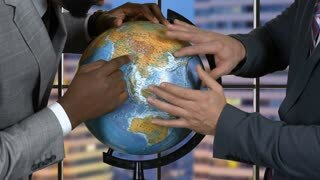 Animation of 3d white people global manager stand with earth planet globe and waving hand. Hello. Isolated on white. Earth hologram, digital globe world/Holographic image of planet earth in binary code on a blue background star clusters. 3D illustration of the virtual hologram communication system in binary code. 1960s: Earth floats in space as moon rotates. clouds float beyond globe of land and water. space capsule orbits planet. astronaut in spacesuit floats out of spaceship with tether cords above world. Rotation planet. Earth globe. World map design. Global sphere planet. Texture map courtesy of NASA.